It really was a large scale project that recently has been completed successfully by the Badische Staatsbrauerei Rothaus AG: It almost took two years and around 30 million EURO were invested to finalise the new- and reconstruction in Grafenhausen-Rothaus where the company is located. Thanks to a new sorting system as well as a new bottle washing machine, which runs with the solar thermal energy, the two plants at the two halls are now working more sustainably, environmentally friendly and energy efficiently. The filling capacity of the new line is now at around 50,000 bottles per hour. 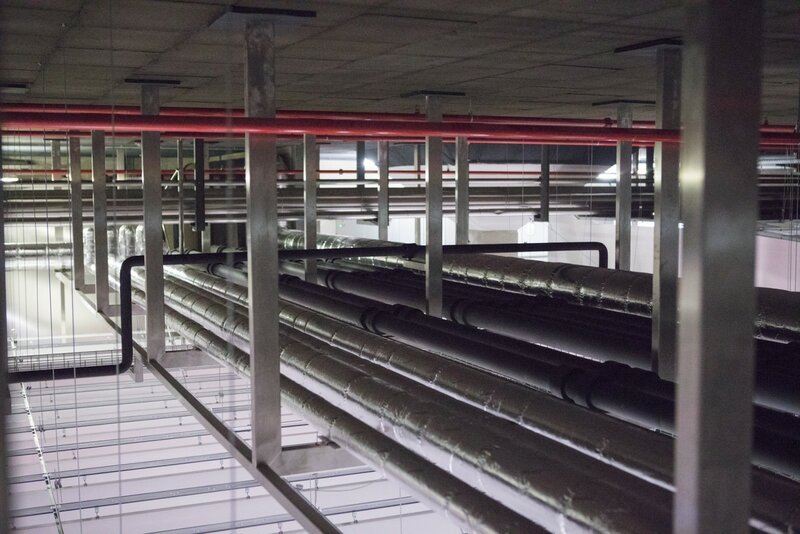 Looking at the plans for the two halls that are linked via a bridge, it is obvious: one of the main challenges of such a project is, to plan the piping intelligently and foresightedly. Therefore, the project manager of the brewery choose a well-known and reliable partner: There is a long lasting cooperation with the traditional brewery and Ruland Engineering & Consulting. Ruland is specialised in planning and constructing systems for liquid products. Right from the start on, the plant specialist was involved into the planning process regarding the new- and reconstruction project of Rothaus. 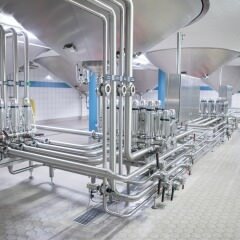 This project was very complex, because the whole machinery and plant components were spread over two halls. Bottle washing machine, pasteuriser, filler, crate washer as well as case packers, case unpackers and taggers – as soon as all these components are set up and installed, it is nearly impossible to afterwards change the course of the piping route or to add new ones. Possible later extensions have to be kept in mind that no important ways for routes are getting obstructed. In practice, the first thing to do is, to plan the layout – where is which machinery placed, how is the product- and material flow and where runs the ventilation system? The next task is, to consider which machinery is in need of what kind of energy like steam, water, electricity or compressed air and also which product- or CIP ports are needed. Corresponding to these needs, planning of the route of the pipes, including the exact position of the respective interface at the individual components of the system starts. As these requirements can vary according to the producer and model, a direct coordination with the respective producer is essential. All in all, 13 kilometres of piping were needed for the reconstruction. But not only the length, also the different usage and nominal size of the pipes needed to be managed. Next to the cable- and ventilation ducts, there is also the main line for the product, the beer, as well as the CIP piping for the cleaning. Additionally, various pipes for water, air, steam, condensate as well as CO2 and pipes for strip lubrication are necessary. Bearing in mind, that amongst others most of the machinery and conveyors have to be provided by compressed air and that at a company with such strict hygiene regulations also needs various positions for injections for cleaning, the dimension of the planning is getting clear and a planning phase about 1,500 hours is understandable. Another important aspect is not only the route of the piping but also the nominal size. To define the needed capacity of the pipes, the demand of each medium has to be calculated as exactly as possible. 19 years ago, the expert for piping projects was for the first time at Rothaus. She sees the trust that has grown over the years and the close partnership as a big advantage at such major projects. According to her they benefit from the short ways and the partnership handling. Together with the customer, Ruland was able to fulfil the new challenges and find answers to various questions that appear at such projects. Also for the Badische Staatsbrauerei Rothaus, the long term partnership with Ruland Engineering & Consulting has great importance. 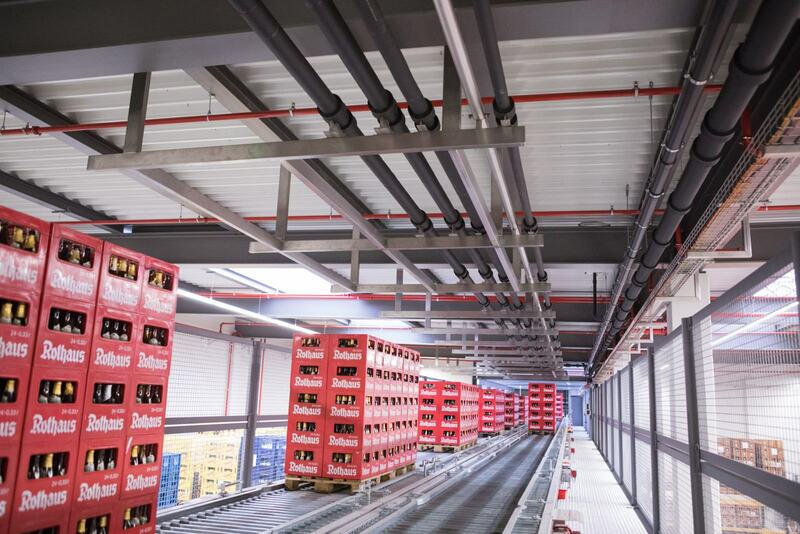 According to Ralf Krieger, the technical Manager at Rothaus, it is important to trust your partner for 100%, especially while planning such a comprehensive project, because it involves more than just a high investment. It always is about long term availability, quality and the safety of the product. Since the beginning of the cooperation, Ruland Engineering & Consulting was involved into various projects at Rothaus. Starting 1999 with a new fermenting cellar, a yeast cellar and a CIP plant. Shortly after, a pressure tank cellar for wheat beer as well as the connection of the intern piping for the filing in the year 2003 and the extension of the fermenting cellar followed. In the year 2004 Ruland Engineering & Consulting planned the new storage cellar and contributed at the planning and piping of the new brew house. 2009 Ruland helped to connect the dealcoholisation system and later on the new Keg system. In the year 2012 Rothaus invested into a new pressure tank cellar, the reconstruction of the filter cellar and the boiler house. Do you want us to plan your plant piping?